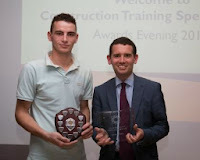 Anglian Building Products Apprentice Jason Barker was one of the many CTS apprentices receiving awards at the CTS Ltd annual awards evening held in Norwich. Jason, who was one of two Anglian Building Products Apprentices nominated, achieved his GQA Level 2 NVQ Diploma in Fenestration Installation in April 2013 and was presented with his Fenestration Apprentice of the Year award by Liberal Democrat MP for Norwich South, Simon Wright. Mr Wright who has clearly shown his commitment to improving education has previously visited the Norwich based ConstructionTraining College where he spent the day gaining hands on experience of life as an apprentice. And recently CTS Ltd and one its apprentices were welcomed by the Deputy Prime Minister Nick Clegg, to parliament for the day to celebrate their success, and take part in a question and answer session with the Deputy Prime Minister. Whatever the future holds, CTS Ltd, who consider themselves to be the best when it comes to delivery of construction industry apprenticeships, will be at the forefront, helping employers to meet their business needs, and achieve success through investment in apprenticeships.